BIO.GRAPHIA :: CONGRATULATIONS TO ANNEMARIE ROEPER, ED.D.! Each of us has a special story to tell. Bio.Graphia provides personal, artful ways to preserve your treasured memories. Whether you are interested in a heart-felt literary tribute to someone you love, a web biography or a full-scale family history, Bio.Graphia combines skillful interviewing with inventive literary expression to creating lasting Life Portraits. My experience as a Literary Agent and Personal Historian allows us to find an individual voice for your story -- as well as success in the marketplace. With over 25 years in publishing, marketing, television and film, my goal is to help people of all ages and abilities to realize their literary and artistic dreams. Bio.Graphia offers an array of elegant, one-of-a-kind presentation formats -- from portraiture to archival-quality collage art -- to create the perfect complement to your personal narrative. Please get in touch with me for a complimentary consultation at 510.919.6117 or e-mail me at biographia2008@gmail.com and we'll get started bringing your dream to life! Gift Certificates & Personalized Packages are always available . . .
CONGRATULATIONS TO ANNEMARIE ROEPER, ED.D.! 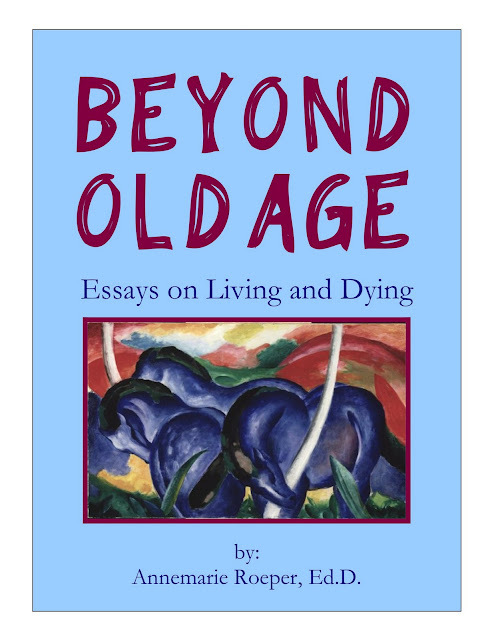 We are thrilled to announce the publication of Annemarie Roeper's new book, BEYOND OLD AGE: ESSAYS ON LIVING AND DYING, by Azalea Art Press. This provocative look at the universal challenges of aging provides a unique view of what it is like to be "beyond old." Annemarie's honesty, as she steps to the edge of existence and embraces the mystery of what it means to be human, gives us all the courage to look at our lives in a more hopeful, compassionate way. At 92 years of age, Dr. Roeper is an educational consultant with more than 60 years of specializing in the needs of gifted and creative children and adults. In 1941, she and her husband, George, founded the Roeper School for Gifted Children in Michigan, one of the nation’s oldest and progressive private schools for gifted young people, still in existence today. Please join us on MAY 7th at 2:30 at The Junket in El Cerrito Plaza, Albany, California, as Annemarie signs her new book as well as her four children's books reissued last year through Azalea Art Press. Advance or credit card orders can be made here. Karen Mireau captured the essence of my 96-year-old mother in her portrait, "Color in Motion: The Life of Miriam Brandschain." I wanted her great grandchildren to know about her generosity and artistic talent. I got more than I expected. The book is beautifully bound in handmade paper, with many photographs. My mother was thrilled with it! Karen knows how to communicate at a deep and meaningful level with people of many types and ages, and to distill that into a memento of richness and beauty. - Marjory Harris, Esq. An informal narrative often used for entertainment, with emphasis on details of actions, of an incident or a series of happenings. A brief inscription or other writing in praise of a deceased person. A word or phrase to describe an actual or attributed quality, as in 'Richard the Lion-Hearted'. Tracing the causes and effects of a person's life in an attempt to evaluate and interpret the facts. A record of events of a person's life and experiences. Something designed to preserve the memory of a person or an event. A notice of death accompanied by a short biographical sketch. A verbal picture or description. An informal biography or concisely presented sketch of the life and character of a person. An extended narrative with an informative purpose emphasizing accurate details of a person's life. A leisurely chronicle of a family or social group, often in novel form. A brief outline of the facts of a person's history. AND NOW FOR SOMETHING YOU'LL REALLY LIKE! * Together we can find the perfect words to express your life story. Please contact me for your complimentary consultation at 510.919.6117 or biographia2008@gmail.com.